Former government officials accused Chinese President Xi Jingping of crimes against humanity for his actions in the South China Sea, bringing their complaint to the International Criminal Court on March 15, just two days before the Philippines withdrew from the body. FOR FILIPINO FISHERMEN. 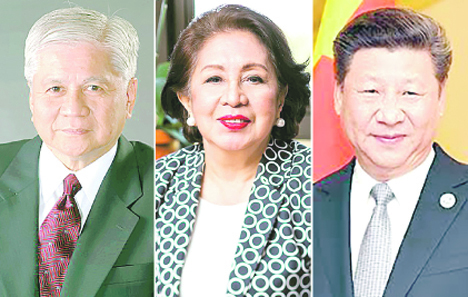 Taking the cudgels for Filipinos and hundreds of thousands of ‘persecuted and injured’ Filipino fishermen, former Foreign Affairs Secretary Albert del Rosario (left) and former Ombudsman Conchita Carpio-Morales (middle) have sued Chinese President Xi Jingping (right) of crimes against humanity for his actions in the South China Sea (pictured above) before the International Criminal Court on March 15—just two days before the Philippines withdrew from the body. “The enclosed communication outlines how President Xi Jinping and other officials of China, in implementing China’s systematic plan to control the South China Sea, have committed crimes within the jurisdiction of the International Court of Justice,” the two former high-ranking Philippine officials said. Del Rosario and Morales said the “atrocious actions of Chinese officials in the South China Sea and within Philippine territory’’ constitute crimes against humanity that can be prosecuted by the ICC. Del Rosario served as secretary of the Department of Foreign Affairs from 2011 to 2016 when the Philippines filed and won an arbitration case against China. 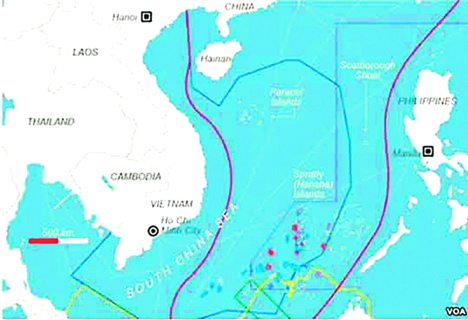 The tribunal affirmed the Philippines’ “exclusive sovereign rights over the West Philippine Sea’’ and invalidated China’s nine-dash line in the disputed South China Sea. Morales was ombudsman from 2011 to 2018, whose office bears the constitutional mandate of prosecuting corrupt officials in Philippine government. “This has seriously undermined the food and energy security of the coastal states in the South China Sea, including the Philippines,” said the communication, which was filed on March 15, two days before the effectivity of the Philippine withdrawal from Rome Statute on March 17. “Though widely publicized, these atrocious actions of Chinese officials in the South China Sea and within Philippine territory remain unpunished, and it is only the ICC that can exact accountability on behalf of Filipinos and the international community, respecting the rule of law,’’ the communication said. “We urge you to initiate a preliminary examination on this matter, if only so the court can apprise itself of Chinese crimes committed not only against the Filipino people but also against people of other nations, which crimes are already known to the international community,’’ Del Rosario and Morales added. “We understand that the Court retains jurisdiction over crimes committed during the period the Philippines was a state party to the Rome Statute (1 November 2011— 17 March 2019), the court exercises its jurisdiction over these crimes even after the effectivity of the Philippines’ withdrawal,” they said, even as they vowed to supplement their communication with additional evidence against the respondents Chinese officials. Attached to the communication was a 17-page outline of how Xi and other Chinese officials committed crimes against humanity including testimonies of Filipino fishermen deprived of their livelihood. The complainant argued that the ICC can conduct preliminary examination because much of the evidence they presented was widespread, highly publicized incidents of Chinese incursions and included those that were already judicially vetted when the Philippines won the South China Sea arbitration against China at the United Nations Arbitral Tribunal in 2016. Besides Xi, also named as perpetrators were Chinese Foreign Minister and state councilor Wang Yi (as primary promoter of China’s plan in the South China Sea, and as such he defends, promotes and facilitates the crimes) and Zhao Jinhua, Chinese ambassador to the Philippines.